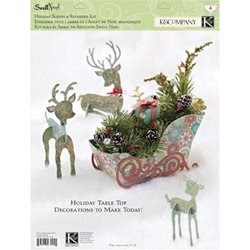 We just added the cutest line of Christmas papers from K & Company, we also have new Bo Bunny Kits, these make great gifts! I have had several requests for acrylic albums so check out the new ones from Clear Scraps. There have also been quite a few 12x12 albums added. While you are here be sure to check out the newest Sassafras Lass. and a really cute line from Die Cuts With a View. We have also added additional colors of Stickles , these are great for altered and Christmas projects. Place an order of $40.00 or more before shipping and recieve this awesome Sled and Reindeer kit free! There is no product code to enter, we will include it with your order. This offer expires Saturday November 22nd. As always, priority shipping within the US is only $4.95. Don't forget to check out the message board.